College is a confusing time for almost every student. As a freshman, starting at a new school in a new town or state is often overwhelming. Many are left wondering how to best navigate through what is sure to be a tumultuous first year of college. Thankfully, the internet is there to help. If you Google “What should a freshman do in college?” the first result is an article titled “35 Things You Must Do Your Freshman Year of College.” Between solid pieces of advice like “get to know your advisor” and “invest in a really awesome planner,” there are far more subjective experiences being pushed as things everyone needs to do. Change your major at least once. Start drinking black coffee. Get a part-time job. Eat in the caf as much as you can. The idea that a student needs to get the full college experience or else be filled with regret is poor advice. There is no universal college experience. Making college students believe they need to complete a list of activities to have a good time is ridiculous and adds undue stress. According to a study done by the University of Minnesota Twin Cities, mental health conditions in college students have increased by 29 percent since 2015. This means that 42 percent of 2400 college students surveyed reported a mental health diagnosis, with anxiety and depression leading the list. College students have enough on their plate without needing to worry about whether their major is as cool as their friends’ majors or going on a date with the purposely wrong type of person. The ideal college experience is not the reality for many students, and that is not a bad thing. If studying abroad is something you cannot afford, do not feel pressure to do it. If you are not particularly interested in playing sports or joining a club, do not feel the need to join one anyway. You know yourself better than anyone else. Getting out of your comfort zone is something that will happen no matter what. College is full of new experiences whether you base them off a checklist or not. Especially at Oklahoma Christian University, there is a particular narrative many people seem to attribute to the average Oklahoma Christian student. Change your major a couple of times, live in the dorm, then live in the apartments and find someone to date who may or may not end up becoming your spouse. Study abroad at least one semester, go on a mission trip and dedicate your free time to a club. Do not be tricked into thinking you must do all of these things to be happy in college. Your ideal college experience is what you want it to be. Other people should not dictate how you live your life or get your degree. Your time at college is your own. Make it what you want it to be. 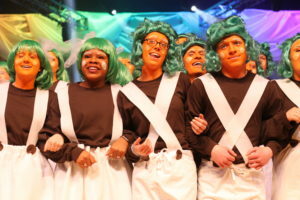 Is Spring Sing a blessing or a curse?